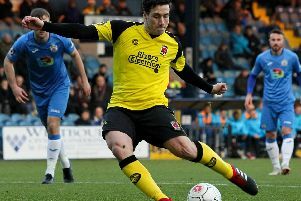 Chorley have already faced 50 games this season and now they face another quick turnaround with a trip to Harrogate on Sunday in their National League North play-off semi-final. Matt Jansen’s side saw off Stockport on Wednesday night in their play-off eliminator at Edgeley Park. But they are raring to go again on the Yorkshire side’s artificial surface (kick-off 3pm). After a jam-packed April Jansen is not fazed by the quickfire nature of the games – in fact he thinks the recent fixture backlog has benefitted his team. He said: “We have hit form at the right time, we have had a stupid amount of games that we have had to battle through. “They have done that with strength. “On Wednesday we went to a hostile environment, a big crowd behind them, it was always going to be difficult but I never doubted my men. They deserve it, not just for Wednesday but for the last 10 weeks. “Some teams will capitulate, some would not be able to handle the pressure of all of those games but not these lads, they are such a strong unit and all credit to them. Adam Blakeman will once again miss out at Harrogate due to suspension. But Jansen praised 34-year-old forward Jason Walker who netted the winner at Stockport. He said: “He’s experienced, he keeps himself really fit, he has been essential for us. “At times during the season he has missed the odd game, he does not like it but I’ve said it is about the squad and the team. Jansen says the fans will be crucial in helping them over the next two hurdles in their bid to reach the National League. He praised the 800-plus fans for their role in cheering his side to glory at Stockport on Wednesday. And with 500 tickets already sold as they prepare to head to Harrogate Jansen feels the Magpies fans can make the difference. He said: “If they can come out in their numbers it is the age old 12th man cliche – it is a cliche but they are so important.